NGC 6872, a barred spiral galaxy in the southern constellation of Pavo about 212 million light years distant, was the subject of recent measurements (including NASA’s GALEX – Galaxy Evolution Explorer Spacecraft)��that were published this year indicating that the extent of the long spiral arms is�522,000 light years across, making this galaxy about 5 times the size of our Milky Way galaxy. �GALEX provided critical ultraviolet measurements to help deduce the size. 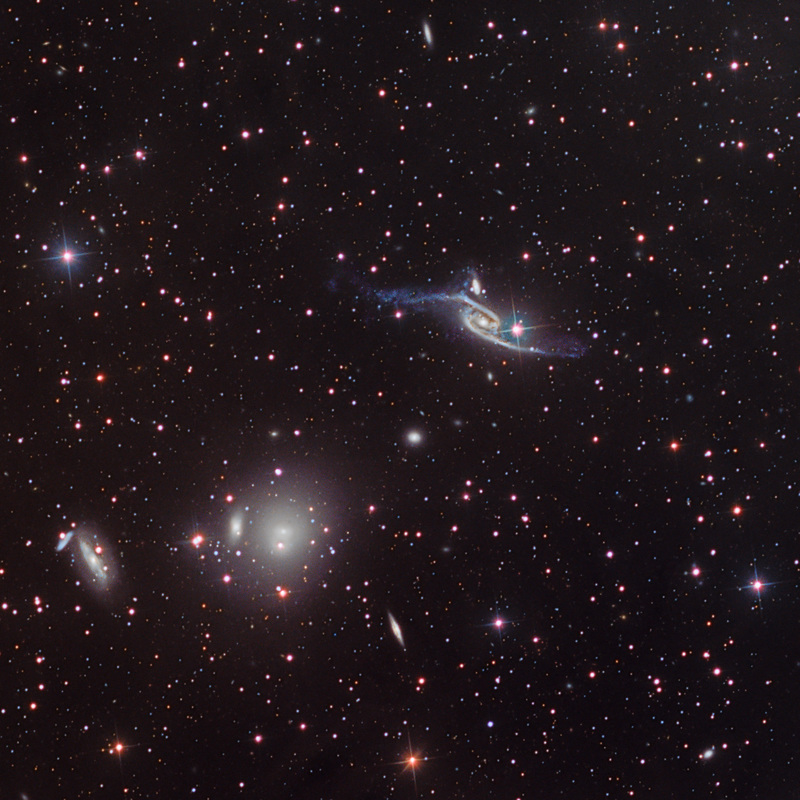 NGC 6872 is in the upper right of my�image above. North is up and East is to the left in the cropped image above.�An annotated, wider version of the area�may be found below (not rotated North). 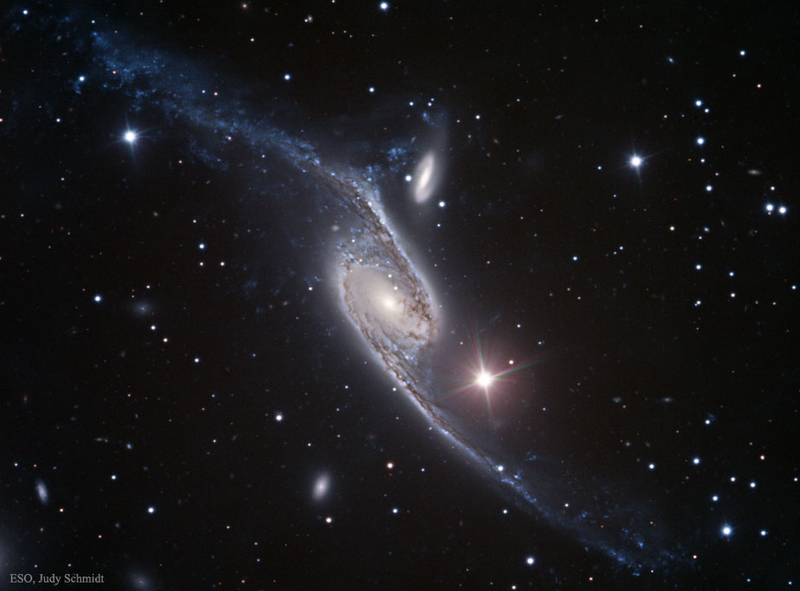 �It is thought that NGC 6872 began interacting with the smaller galaxy just above it, IC 4970 about 130 million light years ago that helped to distort it and create the blue portions of the spiral arms where new star formation is occurring. 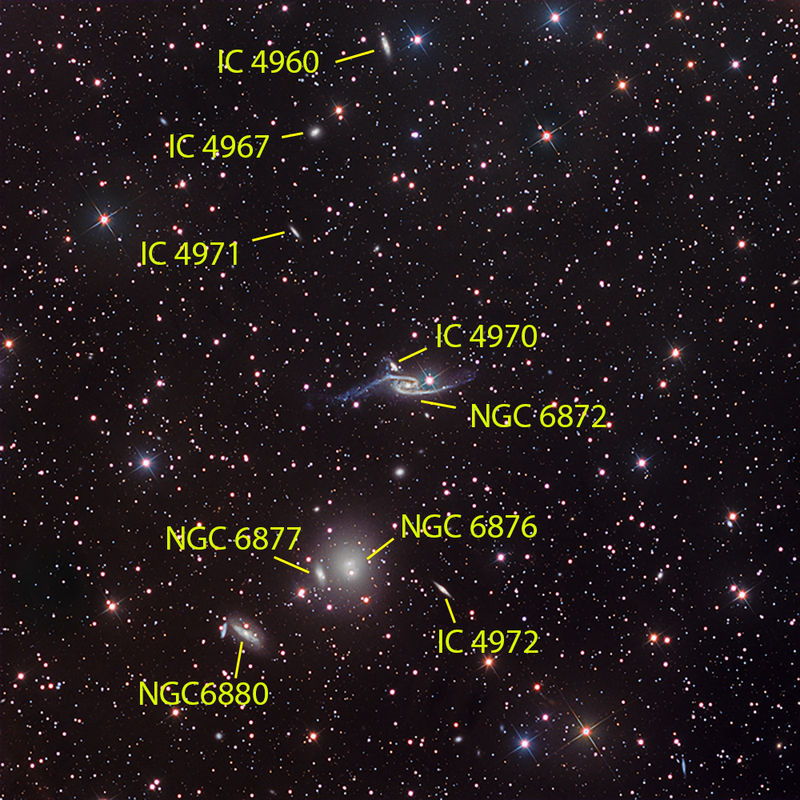 �The other large galaxy to the lower left is NGC 6876, along with several others. � �Lastly, I have shown a picture from ESO’s Very Large 8.2 meter Telescope (VLT) for comparison (Credit: FORS Team, 8.2 meter, VLT Antu, ESO, Processing & License: Judy Schmidt). �Although NGC 6872 is huge, the current record holder is spiral galaxy Malin 1, that is 1.2 billion light years distant and 6.5 times the size of the Milky Way Galaxy.